Dashboard development goes by many names these days. User portal, user interface, user microsite, client administrator…and I could probably find 10 other terms. No matter what we call it, your user will expect easy navigation, intuitive flow, and instant access (read=one click away from what they want). After 5 years of dashboard development, we have noticed that design reigns king again. Clients/members/users don’t want to be confronted with tables of data and lists of links. 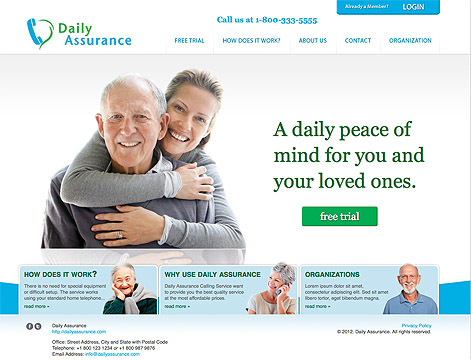 Our recent work with Daily Assurance senior phone service shows that you can have the best of both worlds: tables of data and a positive, visually friendly user interface. The welcome page shows an overview of the different databases available for users to access. The Senior Information Table displays one click navigation to all the data/status associated with each senior. 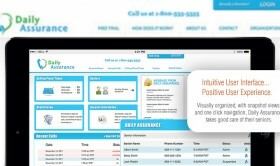 Their dashboard also continues to emphasize and convey their brand message of caring, supportive and easy. Colors, icons, text, and type of navigation stay consistent and unified.